Before having children, you try and anticipate all the expenses that come with your new bundle of joy. The gear. The clothes. One of those major expenses is diapers. And lots of them! I swear it seems like I am buying diapers every time I run to the store. It adds up! After having two children, you find ways to start saving on diapers. You clip the coupons. And you try out the store brands. After 5+ years of having children in diapers, I have learned that not only do store brand diapers work just as well the major brands but they are so much lower in cost. 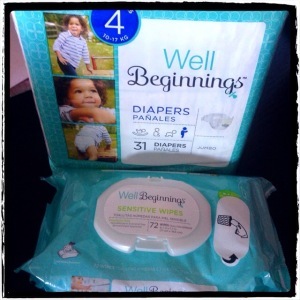 Recently, we tried Well Beginnings diapers available at Walgreens. I am game for trying anything that will save me a few dollars each week. When trying out new diapers, there are three things that I look for: comfort, leackage protection, and finally, price. 1. Comfort. After all, they are wearing the diapers all day long, you want your children to be comfortable. If a diaper feels stiff, I skip right by it. 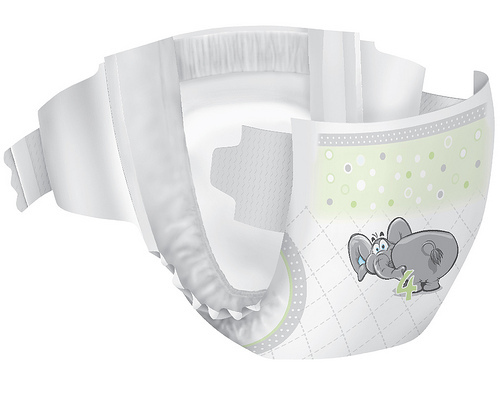 Well Beginnings diapers have cottony soft outer cover and hypoallergenic extra soft inner liner with natural botanicals, vitamin E and aloe. They also have a soft stretchable waist & side panels wrap your baby in comfort. 2. Leakage protection. I need something to keep up with my active baby and also protect him at night. Well Beginnings have excellent leakage protection for both day and night. 3. Price. When a diaper passes test one and two, price is the next factor. Well Beginnings totally fits the budget! Well Beginnings Diapers pass my new diaper test! And to be totally honest with you - I WOULD have taken a picture of my baby in them - but as I was out of town for work - I returned to my husband using them ALL!